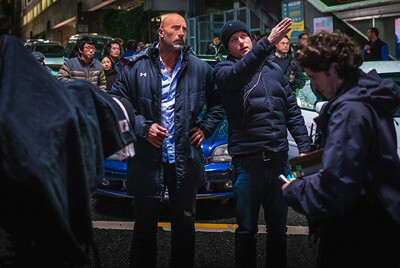 The cards are stacked against those who want to criticize Sawyer as the hero of Skyscraper: coupled with Dwayne Johnson's inherently charming, grinning persona, he's portraying a combat veteran who also copes with being an amputee in his everyday life of being an honest contractor and doting father. Thing is, the story relies too heavily on these sterling character traits and not on other potential layers of his personality, letting those base qualities go on autopilot with effortless assurance that those watching will feel obligated to root for him. The Rock tends to be at his best when he's allowed to flex at least a little of that raised-eyebrow, roguishly confident muscle from his pro wrestling days -- something that can be found in San Andreas and Rampage -- yet there are limitations on Sawyer through his paternal instincts and boy-scout demeanor that inherently put that facet of Johnson's persona on lockdown. Neve Campbell's combat-medic wife is more interesting, humorous, and ultimately underutilized. As I mentioned in the film portion of the review, Skyscraper transpires almost entirely at night and within exterior locations with very limited lighting. This can grow problematic for 4K discs since they're oftentimes a tad darker in brightness and contrast, and that's the case with this 2.39:1-framed, 2160p UltraHD treatment from Universal, though it's a minor stumbling in the way of an attractive visual experience. 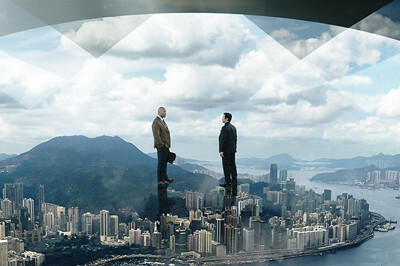 Daytime shots are, naturally, quite attractive: light pools into the high-rise building and onto modern interior design, as well as upon Dwayne Johnson's bearded face, yielding supple details in facial hair and creases, textiles in clothing and tablet covers, and in the angles and contours of the impressive room designs. Shadows are strong but not detail crunching here, adding depth in shots that look out on the horizon. It's in the majority of nighttime sequences that a concern arises here and there, where they struggle against low-balance shadows that occasionally wash out details; the dimness doesn't crush details, really, but the balance makes them occasionally tough to discern. Against the glow of fire that's elevated by HDR's capabilities, however, strong and compelling details emerge amid the combat, while wisps of smoke and the crispness of digital screens offer plenty of firm details, supported by very sporadic bursts of strong color in computer screens and warning lights. A flawed but attractive disc. Big surprise, I know, but in a movie about a building that's enduring explosions, fires, and crumbling structures, there's a lot of activity going on across the full breadth of the surround stage. In almost every respect, the Dolby ATMOS object-based audio treatment remains up to the task, though also not without a few milder concerns. The bombast of the track constantly fills the surround stage, with midrange blasts sprawling across the channels and the lower-end impact telegraphing lots of room-filling bass, giving the track plenty of weight both inside the tower with the terrorists and outside as Sawyer struggles to break in. During more toned-down sequences, dialogue doesn't struggle to be heard at all, having a natural midrange presence. The louder aspects of the film struggle a little bit with higher-end crispness, though: most gunshots are clean enough in the upper end, but hand-to-hand impact feels compressed in the center channel, containing the theatrical heft without the same caliber of robust clarity to seal the deal. Only a few dialogue sequences mid-action struggle with this, though. Again, these are only a handful of instances in what's ultimately a pretty impressive UltraHD sound treatment that's only a few steps away from flawlessness. Skyscraper's extras are worth celebrating out of the gate for being in such impressive density on the 4K disc itself. Along with a range of Deleted (12:10, 16x9 HD) and Extended Scenes (10:18, 16x9 HD) with optional director's commentary, the disc also comes with a number of press-kit caliber extras, containing fairly surface-level interviews that make for cursory viewing after the film. Dwayne Johnson: Embodying a Hero (4:05, 16x9 HD) covers the character that The Rock's playing in the film and how he differs from others in his career, while Inspiration (4:13, 16x9 HD) goes deeper into The Rock's mindspace while playing an amputee and how he hoped to "do right" by those afflicted. Opposing Forces (2:36, 16x9 HD) covers the martial arts facets of the film and how the women in it bring the energy, while Friends No More (3:22, 16x9 HD) delves into a big physical turning point between two of the larger guys in the film squaring off. Kids In Action (2:41, 16x9 HD) focuses on the hunt for the right child actors as a fusion of The Rock and Neve Campbell, and Pineapple Pitch (1:38, 16x9) offers a fun insight on how The Rock gave the thumbs-up -- err, finger up -- on going forward with the movie. Also included, an Audio Commentary with Rawson Marshall Thurber comes from the place of someone who has seen numerous director's tracks in building his film knowledge, and the caliber of his content reflects that of a person who has a decent idea of interest levels and attention span of these tracks. He sticks to a few core tenants, discussing quite a bit about shooting in Vancouver and utilizing his actors, steering clear of chatting about the plot happening onscreen unless there's something pertinent to the discussion. He also touches upon the difference in the difficulty levels of shooting comedies above shooting action films, which goes in a direction that casual viewers might find interesting; it's a longstanding factoid that comedies are actually really tough to shoot. And yes, within the first ten minutes, he bravely addresses the film's "influences" and how that tied into Thurber's lingering desire to create an action movie, a topic he handles candidly and earnestly. There are gaps of silence here and there, but it's a good track. Universal have also included a DVD Copy and Digital Copy slip for the film, tossed inside the standard double-disc black casing and artwork-duplicated slipcover. Skyscraper has the unfortunate distinction of being both overdone and unexciting, one generous described as an homage to a certain other high-rise tower action film from the ‘80s. The areas where it differs are a mixed bag, with Dwayne Johnson embodying a dull distillation of heroic traits as Sawyer, the guy who's going to save his family from the crumbling chaos and trigger-happy terrorizers of futuristic building. 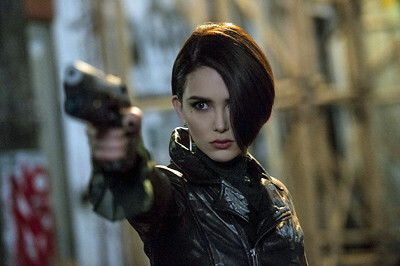 The action tends to be sufficiently loud and aggressive in both the destruction of the architecture and the battles between foes, but neither the screenwriting now director Rawson Marshall Thurber does little to combat the predictability -- and loosely-written logic -- of just about every scenario throughout this family-oriented, PG-13 action film. There's a market and mood for that kind of action film, though, and relative competency goes a long way toward making this one you can feel confident in Renting, especially considering the vigorous ATMOS track and the inclusion of extras on the UltraHD disc itself.